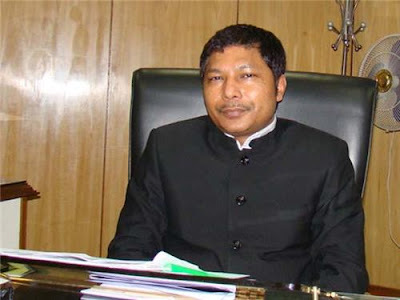 Dr. Mukul M. Sangma is the current Chief Minister of Meghalaya. He is the leader of the Indian National Congress party in Meghalaya. He is the 11th Chief Minister of Meghalaya. He assumed office on 20 April 2010. He is preceded by Dr. D.D.Lapang. Sangma is an Indian politician who was born on 20 April 1965 at Ampati in Meghalaya, India. In the year 1990, Dr. Mukul M. Sangma graduated in medicine from RIMS in Imphal. Other positions he held previously are Deputy Chief Minister of INC, Home and Education Minister of the Government of Meghalaya and Chairman of the Meghalaya Transport Corporation.